In Crockett Johnson’s Harold and the Purple Crayon (1955), the title character — using his crayon — “laid out a nice simple picnic lunch. There was nothing but pie. But there were all nine kinds of pie that Harold liked best.” In that spirit, this blog features my many and varied obsessions. Children’s books. Music. Comics. Humor. Ideas of all sizes and shapes. Musings on life in academe, often coupled with some advice. Want to be informed of new postings? Follow me on Twitter. With the exception of content created by others (such as artwork, music, or guest posts), all content is copyright © 2010-2017 by Philip Nel. All rights reserved. So, for example, the illustration at right (from Crockett Johnson’s Harold and the Purple Crayon) is copyright © by the Estate of Ruth Krauss. But my commentary on it is © by Philip Nel. Got it? Good. 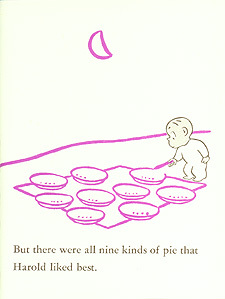 As of February 21 2013, Nine Kinds of Pie is part of The Niblings, a consortium of four children’s literature blogs: Betsy Bird’s A Fuse #8 Production, Julie Walker Danielson’s Seven Impossible Things Before Breakfast, Travis Jonker’s 100 Scope Notes, and (obviously) this one. As of February 2015, The Niblings expanded to include Minh Lê’s Bottom Shelf Books and Mitali Perkins’ Mitali’s Fire Escape (Mitali left the group in November 2017). You can follow us on Facebook at at www.facebook.com/TheNiblings, and on Twitter at twitter.com/TheNiblings4. Megan Montague Cash designed our logo. Learn more about her at her website.